blooming at the height of summer, St. John’s Wort is like solar batteries, ready aid when everything is grey and damp. St. John’s Wort has been touted for depression, but its function is more about the gut than the brain – and so are our emotions! a superstar for liver and digestive function, St. John’s Wort may be telling us to trust our gut. Let’s explore St. John’s Wort a little more deeply today . . .
St. John’s Wort has been widely touted for its ability to resolve depression, and was all the rage for this purpose in the 90s. It’s a little more complex than “take two capsules and your depression is gone”, but it is quite effective in the right situations. Even clinical trials have routinely shown it to be as effective as a variety of pharmaceutical antidepressants. First, though, capsules aren’t the best way to do it: a big part of how St. John’s Wort does its work is through stimulating functions in the digestive system. Which means, you need to taste it, because all of that stimulation starts off on your tongue! 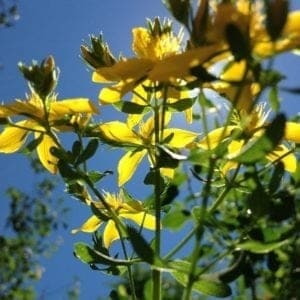 St. John’s Wort has a mild bitter taste that is comparable to black tea, and blends well with a variety of flavoring herbs without losing efficacy. Second, not all depression is the same. When we work with depression herbally, we prefer to be more specific about how that feels: are you feeling like your stress is hunting you and you need a safe space to hide? That’s a great time for Rose. Are you feeling like there’s a hole in your emotional heart? That’s where Hawthorn shines. So, when do you choose St. John’s Wort? There’s a lot of buzz about gut health’s impact on mental health. It’s not just about probiotics – although that’s an important part. But it also turns out that your guts make neurotransmitters like dopamine and serotonin – and if your gut is healthy, it can make buckets of them! You’ve got receptors for those neurotransmitters there, too: it’s all part of the enteric nervous system – your “gut-brain”! The science of this may be new to you, but we already have the concept in our speech: “I have a gut feeling” is not just a turn of phrase. A lot of emotions come from the gut. That’s one of the best times for St. John’s Wort and depression: when it comes along with gut problems or gut sluggishness, when the emotions are sluggish and stagnant. I also love St. John’s Wort when “eating my emotions” is happening. If depression drives you towards cake, St. John’s Wort might be just what you’re looking for! St. John’s Wort blooms on the summer solstice – so we often call it Solsticewort. That’s where the name comes from, actually – the feast of St. John is right at the same time as the summer solstice, and that’s the best time to harvest! 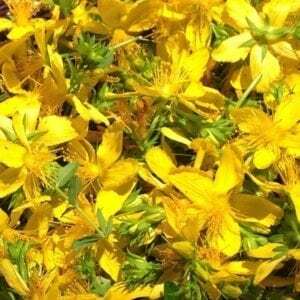 So whether you say St. John’s Wort or Solsticewort, this plant is made of sunshine. 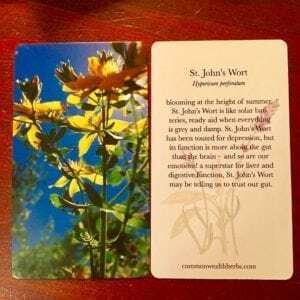 That’s another way to know if St. John’s Wort is right for you: when there’s a seasonal aspect to depression, or a pervasive greyness and a feeling like you’ve lost the sun, St. John’s Wort can help! I love it as tea, blended with a bit of orange peel and a little calendula – it’s a sunny trifecta to get you up and out of the dumps! For something extra special, sweeten it with a spoonful of dandelion flower infused honey: you can’t get any brighter than that! Even if you’ve never had depression, St. John’s Wort is an important plant! It’s a super liver helper, and digestive fixer. Anytime I eat sweets, I crave St. John’s Wort – to help my liver deal with the sugar and all the corresponding insulin. 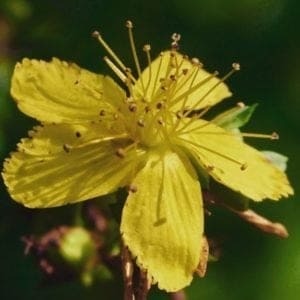 This is also where the cautions around herb-drug interactions come in: St. John’s Wort can improve liver function so well that it can clear or metabolize pharmaceuticals more quickly than would otherwise take place, which may interfere with the drug’s intended action or cause withdrawal effects. Always consult a professional herbalist before combining pharmaceuticals and st john’s wort. If you aren’t taking pharmaceuticals, though, that liver boost is a huge boon – especially when there’s stress on the endocrine system. Whether you’re making a bunch of adrenaline and cortisol to deal with stress, or you’ve had some sugary treats and there’s a lot of insulin floating around, or even just your regular everyday hormonal cascade – all of it goes to the liver to get broken down and recycled when it’s done. If your liver isn’t up to snuff, hormone imbalance is a common result. St. John’s Wort can help your liver keep up with its to-do list, and give it an extra boost in hormonal crunch time! PS: This is awesome for kids in puberty! PPS: My teenaged daughter took this photo – I love it! Want to learn more about herbs that can make your life better? Check out our Materia Medica program – it’s a complete herbal toolkit to keep you healthy and strong!